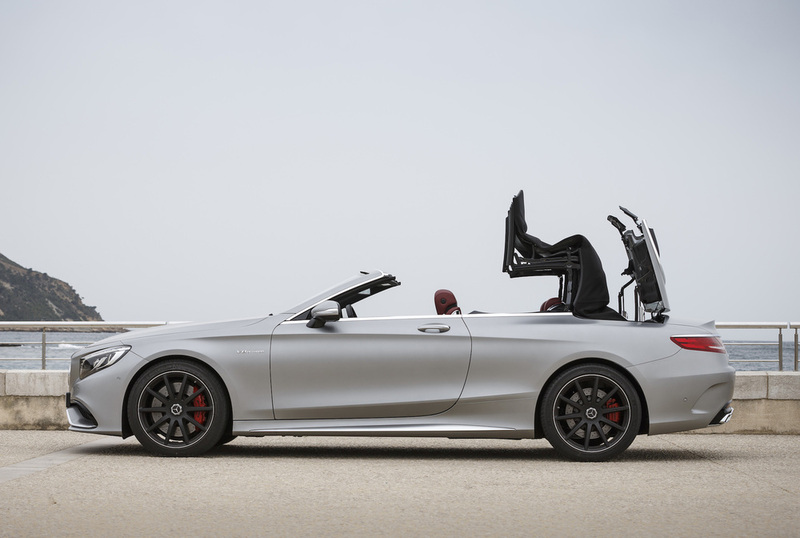 Somewhat surprisingly, and indeed inexplicably, Mercedes-Benz hasn’t produced a convertible version of its range-topping 4-seater coupe for some 45 years. The 220 SE Cabrio introduced in 1961, and the four variants which followed – the 6-cyl 250, 280 and 300 SEs, plus the V8 280 SE 3.5 – were all particularly elegant open-topped models which are now highly sought after by collectors with values to match. From 1971 onward, the two-seater SL range represented the pinnacle of Mercedes convertibles, this despite there being a succession of luxury four-seater SEC and CL hardtop coupe models from 1981 onward. In 2014 the CL underwent a name-change to S-Class Coupe in 2014, and two years on we now have the new S-Class Cabriolet, a model based on the S-Class Coupe, which in turn is based on the luxury S-Class saloon. Under the S 500’s bonnet is a spectacularly smooth and responsive 455hp 4,663cc twin-turbo V8. With 700Nm of torque (from 1,800-3,500rpm) and a 9-speed auto transmission the 2.1-tonne car hauls to 62mph in 4.6 secs and on to 155mph, but more relevant is its thumping overtaking prowess. Put your foot down and the motor growls, but it’s a much more refined growl than that of a Detroit musclecar. 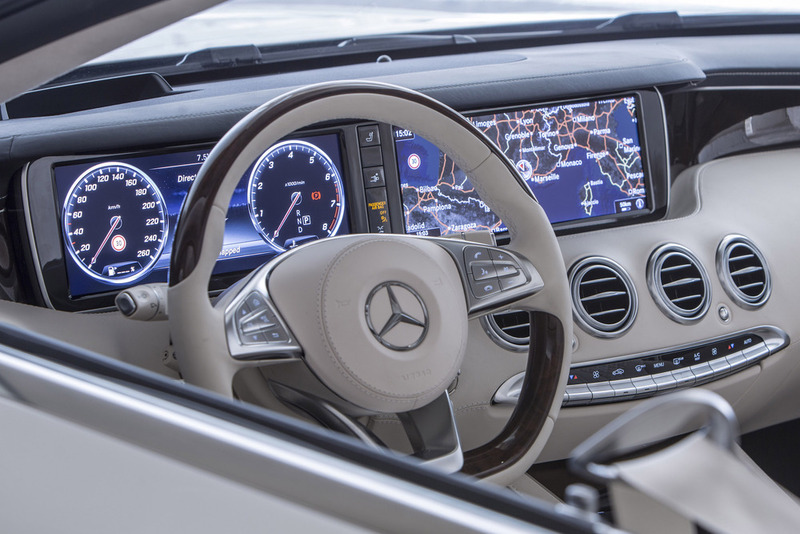 The S 500 goes like stink if you ask it to, but if you’re in the mood to cruise, as most owners will be most of the time, then it will oblige with uncanny serenity, and return an mpg figure in the high 20s – officially 32.5mpg. Around town the engine and exhaust are effectively inaudible, even with the roof down. Without exaggeration, I’ve driven mechanically noisier electric cars. The S 63 boasts a twin-turbo 5,461cc V8 that puts 585hp and 900Nm (from 2,250-3,750rpm) through its 7-speed MCT sports transmission. It’s also limited to 155mph in standard trim, but it can hit 62mph in 4.2 secs. The S 63 is neither as quiet as the S 500 – it’s quad exhausts rumble threateningly at low speed and bellow menacingly when the wick is turned up, and it’s thirstier too. Reckon on low-to-mid 20s (officially 28mpg). Nor is the S 63’s engine quite as silky smooth as the S 500’s, but brute force and thunder is what AMG is all about. For those who really don’t like to be outdone in any way, the AMG S 65 Cabriolet boasts a V12 engine which produces a massive 630hp with 1,000Nm of torque from 2,300-4,300rpm. This takes it to 62 in 4.1 secs and it would doubtless reach its electronically-limited 155mph maximum with even greater ease. Like the S 63, the S 65 can also be specified with the AMG Driver’s Package (add £2,760 to the S 63’s price, or £765 to the S 65’s) which increases the still limited top speed to 186mph. Mercedes didn’t bring along any V12 S 65s to the recent press launch, so no driving impressions of that one for now. Despite their size and weight, the S 500 and S 63 are decently agile and so can be hustled along a twisty road with some panache. They’re not sports cars as such – the 500’s steering in particular feels a little remote and artificial – but for a large and luxurious cabrio that doesn’t constitute a criticism. What’s beyond any doubt is that the standard AIRMATIC air suspension with adaptive damping provides a velvety ride, especially on the S 500, while also maintaining good poise and composure. As now expected of a car of this sophistication, driving settings and dynamic characteristics can be electronically adjusted on-the-go to suit mood and driving style, but those variables aside there’s no mistaking the sporty AMG’s tauter steering and firmer ride, while bigger wheels with sportier tyres also bestow the AMG with even more grip, should you require it. Much of the above would also of course apply to the S-Class Coupe range – the big difference here being the Cabrio’s cloth roof. When soft-top models are created from hard-tops, body rigidity can be an issue, but not on this Benz; it’s rock solid, and if there is any flex or movement anywhere then it’s undetectable. Same goes for wind noise in the cabin. With the roof lowered the AIRCAP ‘wing’ automatically rises a few centimeters above the windscreen frame to silence any turbulence, while the roof’s various layers, damping measures and double glazing keep things limo-quiet with the roof up. 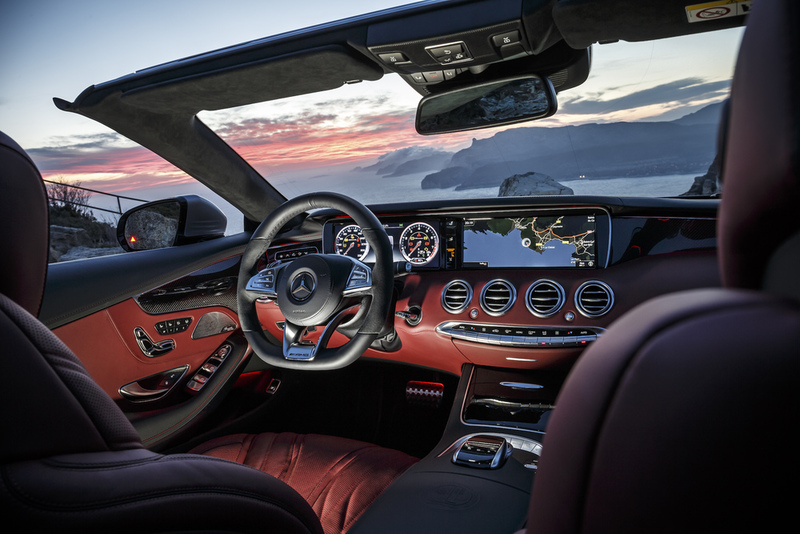 At speeds up to 31mph, the roof can be electronically raised or lowered in under 20 seconds, and should you feel a bit chilly then there’s intelligent climate control, Mercedes’ AIRSCARF neck level heating system and heated seats front and rear. Still chilly? The Warmth Comfort package adds a heated steering wheel and even heated armrests in the front. The equipment lists, both standard and optional, are as long as your arm, but they include items such as head-up display, Intelligent Light System, COMAND online satnav, plus Driver Assistance, Night View Assist and Premium packages, plus several more AMG-specific packages. Where the S-Class Cabrios aren’t overly generous is in the areas of rear seat legroom, which is pretty tight, and boot space. The 500 can accommodate little more than three items of aircraft cabin baggage, those three items being a tighter fit in the 63’s slightly smaller boot. 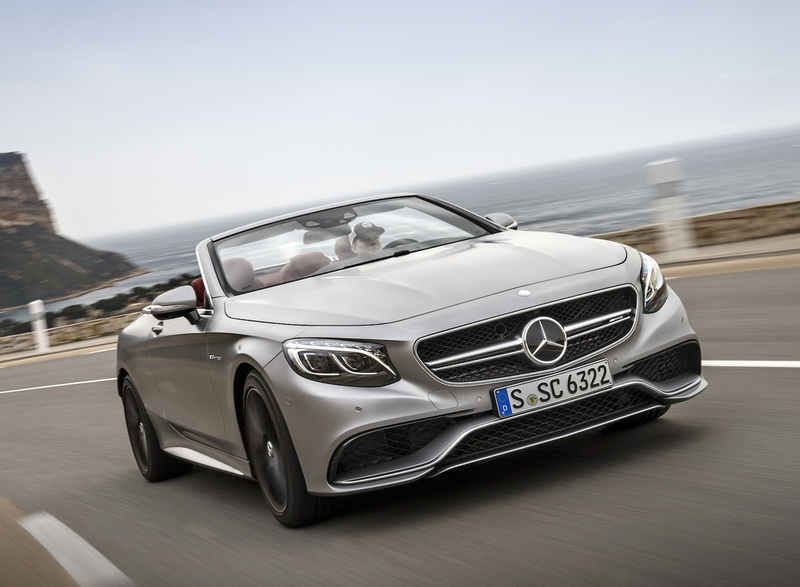 Other than that potential luggage inconvenience there can be no questioning the new S-Class Cabriolet’s all-round competence and impressive capabilities. Were I in the enviable position of being able to afford one (and had ruled out its Bentley Continental, BMW 6 Series and Maserati GranCabrio rivals) I’d definitely opt for the super-civilized and ultra-refined S 500. Impressive though the AMG S 63 variant is, and no doubt the S65 too, for my money their huge power and speed is at odds with the true rationale of a sizeable and sumptuous cabriolet.